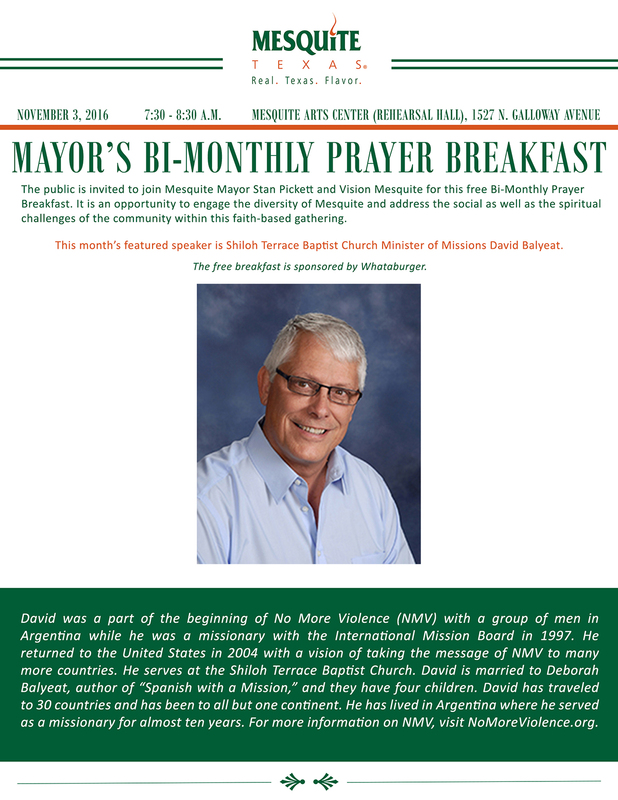 We are grateful for the opportunity to speak to those gathered in Mesquite, TX for Mayor Stan Pickett’s prayer breakfast. The difficulty of violence in the cities of North Texas has made the No More Violence message applicable for this time in history. Those in attendance received the challenge that we are all participants in the solution and need to stay clear from being part of the problem. David Balyeat, NMV International president spoke to those gathered that the church of the lord Jesus is to be a preventative agent, not a reactionary one. “Salt is a preserving agent and light expels darkness.” The doors to the city of Mesquite are beginning to open and for this we are very grateful.